Hurricane Lane spun in a dangerously unpredictable path Friday as it lumbered toward Hawaii, dumping rain on the mostly rural Big Island and forcing more than 1,000 people to flee to emergency shelters. The Category 2 storm had winds of about 110 mph, with stronger gusts. It was unclear when the system would make an expected turn west and barrel toward the island chain. Even though it was not projected to make a direct hit on Hawaii, the storm could pass close to the islands, bringing a huge storm surge, high wind and heavy rain, meteorologists said. "There's a lot of uncertainty in this forecast," warned Federal Emergency Management Administrator Brock Long. "We're going to see torrential rains occur for the next 48 to 72 hours. We hope all citizens are heeding the warning that local officials are putting out." 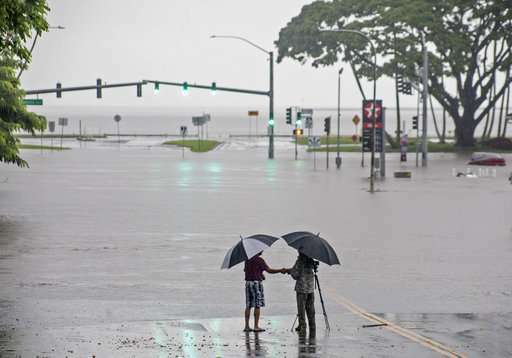 Early Friday, National Weather Service meteorologist Chevy Chevalier described flooding on the Big Island as catastrophic. Some areas recorded 35 inches (89 centimeters) of rain in 48 hours. The hurricane was edging away, and may drop less rain, but the Big Island "is not out of the woods," Chevalier said. "The sponge is full," he said. "There's nowhere for the water to go except to pond up and flood these areas." At 5 a.m., the center of the hurricane was about 200 miles south of Honolulu. The island had recorded wind gusts up to 60 mph (97 kph). Oahu and the other central islands of Maui, Molokai and Lanai were bracing for hurricane or tropical storm conditions later Friday. Many of the safety concerns focused on high surf and storm surge, Chevalier said. "We're expecting surf in the 15- to 20-foot range on the southern shores of these islands," he said. When heavy rain falls on steep mountains, "that water comes down fast. So it comes down and joins the water that's coming up on the southern shores and what does that do? If floods the coastal areas." 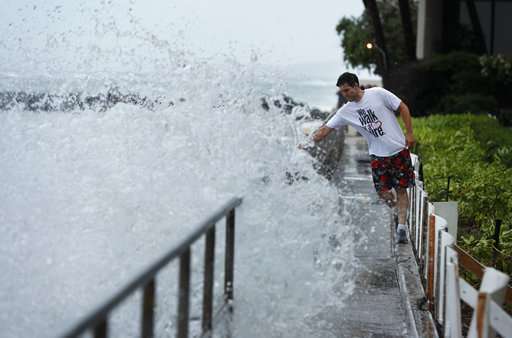 Police warned tourists to leave the world-famous Waikiki Beach ahead of the storm's arrival in Honolulu. So far, about 1,500 people, mostly on Oahu, were in emergency shelters, said Brad Kieserman of the American Red Cross. 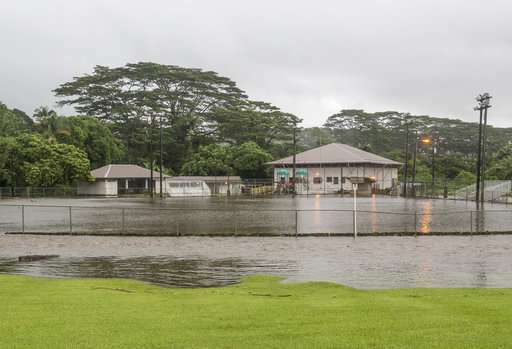 Emergency crews rescued five California tourists from a home they were renting in Hilo after a nearby gulch overflowed and flooded the house on the Big Island. Suzanne Demerais said a tiny waterfall and small stream were flowing near the home when she first arrived with four friends from the Los Angeles area. But the stream turned into a torrent, and the river rose rapidly over 24 hours. Hawaii County firefighters, who were in touch with the home's owner, decided to evacuate the group before the water rose any higher. They floated the five out on their backs, Demerais said. "It was quite an experience because we weren't planning to have a hurricane during our vacation time," Demerais said. Elsewhere, a brushfire forced the relocation of a hurricane shelter in Lahaina on the island of Maui. Nearby residents were also being evacuated. A Maui County spokesman said it's was not clear if the fire was hurricane related. 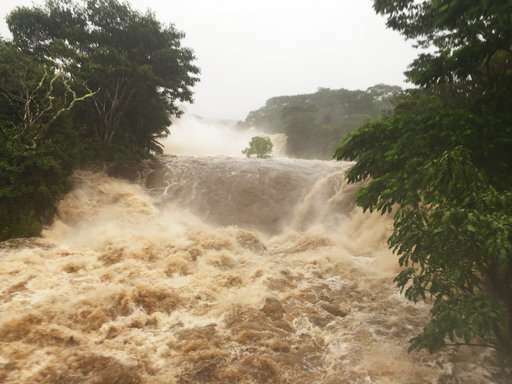 Hurricane Lane lashed the Big Island with more than 30 inches (76 centimeters) of rain in about 24 hours. 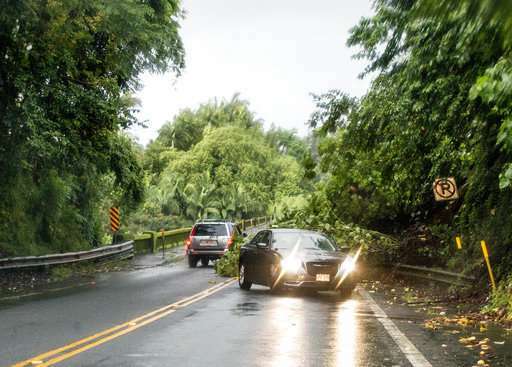 A wind gust of 67 mph (107 kph) was recorded at Kohala Ranch on the northern side of the island. 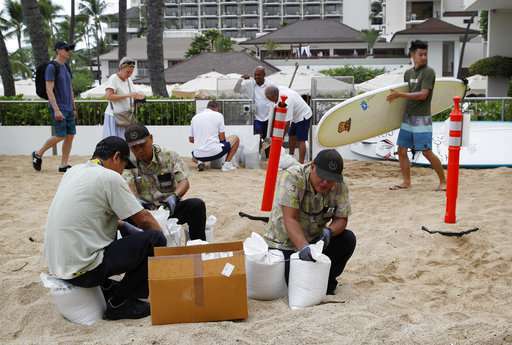 About 200 miles (320 kilometers) north of Hilo, on the state's most populated island of Oahu, employees of the Sheraton Waikiki resort filled sandbags to protect the oceanfront hotel from surging surf. 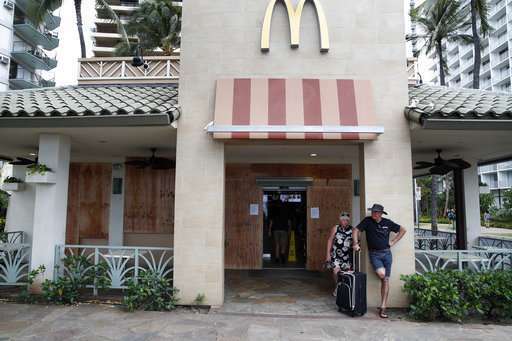 At the Hilton Hawaiian Village, guest Elisabeth Brinson said hotel staff left a notice that rooms will still have water and phone service, and a backup generator would power one elevator per building in the event of an electrical outage. "We knew it was coming, so I tried to just cram as much as I could into the last few days in anticipation so we could cross things off of our list," said Brinson, who is used to hurricanes after living in Florida. United Airlines canceled its Friday flights to and from Maui. The airline added two more flights from Honolulu to San Francisco on Thursday to help transport people off the islands. 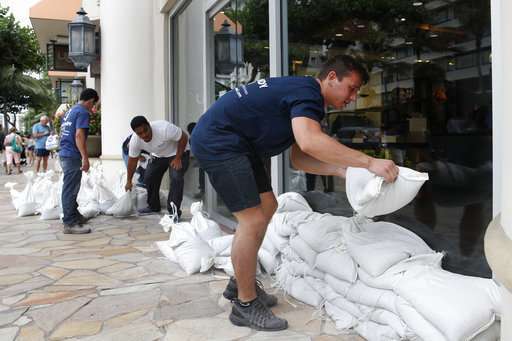 The biggest hotels were confident they could keep their guests safe as long as they stay inside, said Mufi Hannemann, CEO of Hawaii Tourism and Lodging Association. "The only concern is those that venture outside of the properties, that would like to hike on a day like this or who would like to still go into the ocean and see what it's like to take a swim or surf in these kind of waters," Hannemann said. The Federal Emergency Management Agency moved several container ships packed with food, water, generators and other supplies into the region ahead of Hurricane Hector, which skirted past the islands more than a week ago, Long said. Warehouses were double-stocked with emergency supplies, and federal officials were working with grocers to ensure stores would have enough food.